Christopher Allambridge was mentioned by name in the Letters Patent of Charles I requesting a charitable collection from the nation in response to the Great Fire of Yeovil of 1640. Christopher Allembridge the elder was most likely born in the latter part of the sixteenth century and from his will dated 1645, the year he died, both his parents were alive at this time as was an un-named brother and a sister, Mary, who was married and had a child. His wife was named Joane and they had one surviving son also called Christopher. In his will dated 1645 Christopher Allembridge the elder described himself as a mercer although he was mentioned in a document dated 1634 as a 'Tobacconist of Evill'. It appears that he held land in Halstock as well as in the manor of Hendford (possibly the "five acres of land lying in the Comon Fields of Yeovill" referred to below). His dwelling-house was "called by the name of ye sign ye Beare", so it would seem that Christopher was also one of Yeovil's early landlords, or at least owner, of an early alehouse. It was described as being "in ye Burrough of yeavel" although whether this meant the Borough (being part of High Street) or simply the town of Yeovil is not clear. His will also refers to "his shopp" but whether this was integral with the Bear or separate premises is also not clear. Christopher the elder died in 1645 and was succeeded by his son, Christopher the younger, who ran the 'shopp' and was described as a grocer in a deed of 1659. 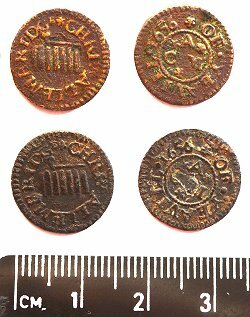 From the token dated 1656 below we can also see that he was a tobacconist like his father. At top, for clarity, is an illustration of a Christopher Allembridge the younger farthing token and below it two examples from my collection. On the obverse, within an outer twisted wire circle, it is inscribed "CHRI ALLEMBRIDGE" around the image of a pipe and roll of tobacco. On the reverse is "OF YEAVELL" and the date 1656 around a plain wire inner circle containing "A.C.M." - again these three initials represent the forenames of the issuer and his wife plus their surname. Christopher Allambridge was recorded as a "Tobacconist of Evil" in 1634. However, since the wife of Christopher Allembridge the elder was named Joane and he died in 1645, it is clear that this token was issued by the son, Christopher Allembridge the younger, whose wife's name began with an 'M'. Christopher Allembridge the younger also inherited the Bear Inn and was recorded in the following deed dated 24 February 1659 which also described him as a grocer - "Feoffmt between James Earl of Northampton, Thomas Newton Esq.,& Tho. Newton Gent. of the one part & Christopher Allambrige Grocer & Maximilian Bard & Thomas Bard Grocers of the other. The sd. Newtons by the appointmt. of the Earl & Nomination of Allembridge Did Grant to Maximilian and Thomas Bard a messuage called the Bear Inn with the appurts. situate in Yeovill in the County of Somerset and also five acres of land lying in the Comon Fields of Yeovill. To hold to Maximilian and Thomas Bard & their Heirs in Trust for Allambridge in fee. In this Grant is excepted a lease made by Earl Spencer of the Manr. of Yeovill to Sr. Edmd. Pye for 99 years which was then vested in John Howel & Geo Goodman Esqrs. who were to grant their Term in sd. Messuage &c. to Allambridge, and there is also an Exception of such Right of Interest which Allambridge had in sd. Messuage &c. by Copy of Court Roll." It would appear that, like his father before him, Christopher Jnr was also a Warden of Woborn's Almshouse and a deed dated 1649 concerning the Dye House behind the Pall Tavern (both Almshouse properties) recorded "The Dye House changed tenants once more in 1649 "Lease for 2 lives at annual rent of 6s. - John Cary, custos, Richard Lockett, gent., Christopher Allambridge, wardens, to Thomas Churchouse weaver of Yeovil, house called the Dye House between Almshouse on east and tenement (the Pall building) belonging to the Almshouse held by William Swetman senior on west, lives of William Swetman and Elinor his wife. fine 25s. Witnesses - Morgan Hayne, John Withell, John Cary. 8 May 1649." (Woborn Almshouse Muniments No. 34). In a document dated 23 December 1657 in the Helyar documents and muniments from Coker Court, now in the Somerset Heritage Centre, Taunton, the following is recorded "At a peppercorn rent, from Christopher Allambridge, of Yeovil, grocer, to Bridget Harbyn of Trent, Co. Som. spinster, of two closes called Cox' closes in Pitney, near Yeovil." The two fields were, of course, in Kingston Pitney, Yeovil, not Pitney near Langport. In the Poor Rate of 1664, Christopher Allambridge is recorded twice; paying 4s 4d (Borough) and 2s 0d (Hendford). I am assuming that the Christopher of the Borough was 'the Younger' and the Christopher of Hendford, in a lesser property, was his son 'the Youngest'. In 1667 a further lease concerning the Dye House recorded Christopher Allambridge as a gentleman, inferring perhaps that he had risen in Yeovil society - "Lease for 3 lives at annual rent of 6s.8d. - Gyles Hayne, custos, George Prowse, gent., Christopher Allambridge, gent., wardens to Thomas Churchouse, weaver of Yeovil, house called the Dye house between the almshouse on the east and tenement (the Pall building) of the same almshouse held by William Swetnam senior on the west - Lives of Thomas Churchouse, Elizabeth his wife, and Elianor their daughter. fine £4.10s. (mark of) Thomas Churchouse - Witnesses: John Cary, Matthew Wills senior, Matthew Wills junior. Endorsed; quiet and peaceable occupation taken - 16 May 1667" (Woborn Almshouse Muniments No. 63). By 1694 Christopher Allembridge the younger was dead and the Bear Inn passed to his son, also Christopher Allembridge, noted in a deed dated 22 April 1694 - "Chris: Allambridge Son & Heire of sd. Chris: Allambridge deced". In 1725 a Court of Chancery case referred to Christopher Allambridge as a 'goldsmith of Yeovil'. Whether this refers to Christopher III or Christopher IV is not known. 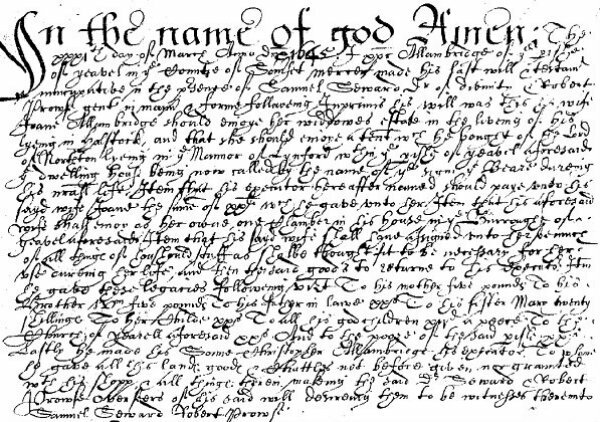 Christopher Allembridge the elder's will was proved in London on 26 February 1646, although that part of the will is written in Latin.